Chapati: Chapati (alternately Chapatti, Chappati or Chapathi) is an unleavened flatbread (also known as roti) from India, Nepal, Bangladesh and Pakistan. It is a common staple in South Asia as well as amongst South Asian expatriates throughout the world. Chapatis are one of the most common forms in which wheat, the staple of northern and western India, is consumed. Chapatis are made from a firm dough made from flour and water. Take whole wheat flour in a bowl. Seive the whole wheat flour with salt. Add in a bit of water and oil. Keep adding some water to the dough in parts and start to knead the dough. Continue to knead the dough and add water as required. Knead the dough till it becomes pliable and soft. The final dough consistency should not be very soft or hard. Make 12 small to medium balls of the dough. Roll the dough balls in the palms of your hands. Sprinkle some whole wheat flour to the dough ball. Put the tawa/griddle to on high heat. While the tawa is getting hot, start rolling the dough ball into a flat round circle to make chapati. 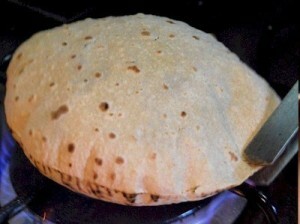 Once the tawa is sufficiently hot, put the chapati on a hot tawa. First cook on one side. The chapati should be less than half cooked or about one-fourth cooked. Turn and cook the other side till the brown spots starts to become visible. Now hold the chapati with a tong and keep the first side which was cooked, directly on fire. The chapati will start to puff. Turn and keep the other side on fire. Keep for few seconds and remove from the fire. Avoid burning the chapati’s and also don’t overdo it as chapati will not be soft and will become crisp and hard like papads. Serve the hot chapati with a curry of your choice. Note: If you cannot serve the chapati hot, then you can keep them in a container that keeps food warm like a casserole or in a roti basket. You can also wrap them up in a kitchen towel or napkin. If you have any queries regarding the Chapati recipe, please leave a comment.